How the U.S. Is Empowering Iran in Yemen? The roots of the current conflict in Yemen trace back to the early 2000s, when Houthi rebels from the northern region of Saada repeatedly rebelled against the regime of then resident Ali Abdullah Saleh, hoping to increase their share of state patronage. Arab Spring protests in 2011 forced Saleh to step down and hand power to his second-in-command, Abd Rabbu Mansour Hadi. Behind the scenes, however, Saleh schemed with loyal military forces to retain his influence. Taking advantage of the ensuing chaos, Houthi rebels conquered the capital, Sanaa, in 2014. By the following year, they controlled much of Yemen. Fighting against the Houthis—and among each other—were supporters of Hadi’s government, a local al Qaeda branch, southern separatists, and a collective of local actors. Blithely ignoring this complexity, Saudi Arabia and the United Arab Emirates entered the war in March 2015, seeking to put Hadi back in power and fight the Houthis, whom they saw as a proxy of their archenemy, Iran. Saudi and Emirati leaders feared that, through the Houthis, Iran would gain a foothold in Yemen much as it had done in Lebanon, where Tehran has a powerful proto-state ally in the form of Hezbollah. Saudi leaders predicted that the intervention would quickly tip the scales and that the civil war would end after only a few weeks. Three years later, what was supposed to be a short, decisive intervention has ground on, with no end in sight. The campaign has reclaimed parts of southern Yemen from the Houthis. But the insurgents have kept control over the capital, Sanaa, and still boast tens of thousands of armed fighters. There has been good reason for policymakers in Saudi Arabia, the UAE, and Washington to worry about Iranian ascendance across the region. Tehran’s closest ally, Syrian dictator Bashar al-Assad, has made steady headway against insurgent groups, including forces backed by the United States and its allies. In May, elections in Iraq and Lebanon boosted the influence of Iranian-backed groups, while the United States’ and the Saudis’ favored candidates suffered setbacks. An Iranian member of parliament has famously boasted that his country controls “four Arab capitals”—Baghdad, Beirut, Damascus, and now Sanaa. Yet it’s easy to overstate Iran’s hold on the region overall—and on Yemen in particular. In reality, the Houthis and Iran are allies of convenience against the U.S.-backed Saudi military campaign. Although the Houthis are commonly referred to as Shiites, their faith more closely resembles Sunnism than Shiism as practiced in Iran. Unlike the Lebanese Hezbollah, they do not profess loyalty to Iran’s Supreme Leader. The Persian-Arab divide, the Houthis’ focus on accessing state patronage in Yemen, and a strong sense of Yemeni independence also complicate the idea that the Houthis are Tehran’s proxies. But because of the Saudi-led campaign meant to push back on Iran, Tehran now has an opening in Yemen it might otherwise not have had. Iran gives the Houthis arms, including short-range ballistic missiles, and in exchange the Houthis have offered it an entry into a part of the world where its influence had once been limited. Houthis have threatened ships off the Yemeni coast with Iranian missiles, even hitting a Turkish ship delivering humanitarian aid. And their slogans, speeches, and media strategy increasingly echo those of Hezbollah, lending some support to Saudi fears that the group may be turning into a Yemeni version of Iran’s Lebanese proxy. In addition, Shiites in other countries are embracing the Houthi cause as part of what they see as a larger struggle against Sunni hegemony. The UAE has deployed significant ground forces, while Riyadh has flown over 100,000 sorties and spends $5 billion to $6 billion a month on the war—far more than Tehran spends on support for the Houthis. The war has killed around 10,000 people, and a Saudi blockade of Yemeni ports has exacted a bitter humanitarian toll. Last year, Yemen suffered the world’s largest cholera outbreak. Starvation and disease have killed more than 50,000 children, and hundreds of thousands more are malnourished. The blockade has been loosened, but the damage it brought has turned many Yemenis, long distrustful of their Saudi neighbor, even more hostile. It has also hurt Saudi Arabia’s image in Europe and other parts of the world that care about the suffering of the Yemeni people. Even as Yemen implodes, U.S. allies sink into the quagmire, and Iran’s influence grows as a result, the United States has provided tacit support for the Saudi-led military campaign. Under Barack Obama, U.S. policy in Yemen was often confused, struggling to balance humanitarian concerns with a desire not to alienate U.S. allies. When Saudi Arabia and the United Arab Emirates launched their intervention in 2015, the Obama administration neither wholeheartedly embraced nor strongly opposed it, eventually settling into lukewarm acceptance. Quietly, the United States—along with France and the United Kingdom—provided intelligence and air refueling along with other logistical support. Before leaving office, Obama gave the Saudis a symbolic wrist slap, halting the sale of smart bombs to the kingdom because of the war. This proved to be the worst of both worlds, angering allies while doing nothing to stop the intervention or improve the situation in Yemen. Trump quickly lifted Obama’s smart bomb ban, but his administration has not veered dramatically from Obama’s policy of cautious and grudging support, especially after a botched special operations forces raid in Yemen led to the death of a U.S. Navy SEAL and perhaps over 20 civilians in early 2017. In June, the United States rebuffed a request to join the UAE-led offensive on Hodeidah, a crucial port through which food and other supplies go into Houthi-held areas. Still, the International Crisis Group has described the U.S. State Department’s messaging on the offensive as a subdued “yellow light” that allies can confidently ignore. More broadly, the Saudis and the UAE feel empowered by the strong embrace the Trump administration has given them up to this point and see no need to change course in Yemen. Washington should end its casual support for its allies’ ill-fated and destructive efforts. Doing so is in its own strategic interest: Iran is stronger in Yemen than it was at the outset of the Saudi-led intervention. 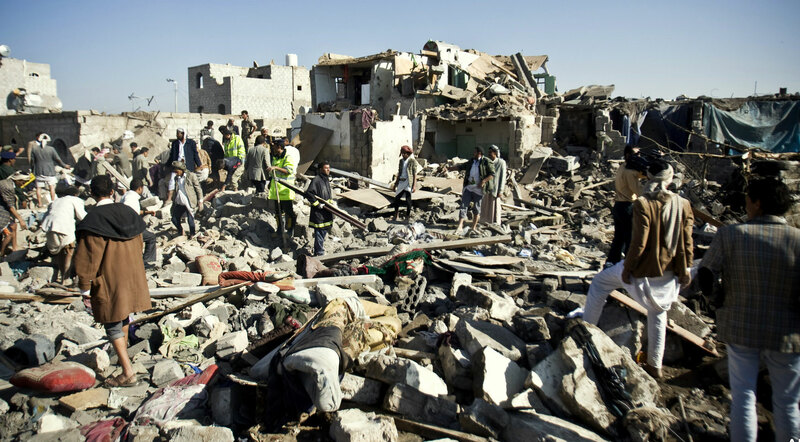 The United Arab Emirates and Saudi Arabia have spent tens of billions on the war, and many Yemeni hate them for the destruction they have brought. Even with a Houthi defeat in Hodeidah, the war will likely drag on.